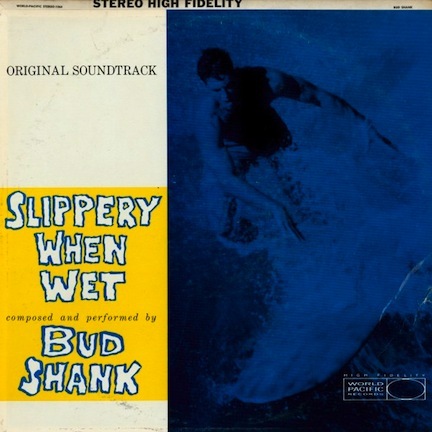 The 279th Sountrack of the Week is Slippery When Wet, a surf film scored by Bud Shank. There are occasional suggestions of standards in the tunes and the feel throughout is swinging and/or bluesy. It's interesting to hear Gary Peacock in this context. It's probably the most mainstream thing I've heard him play on. His performance is very strong. Billy Bean's guitar playing is also very impressive. He's somebody you don't hear much about. The drummer, Chuck Flores, is also great. He reminds me of Shelly Manne. Shank plays very well also, somewhere in between Sonny Stitt and Lee Konitz, I think. It's a great record and fans of the late '50s West Coast jazz scene will love it.